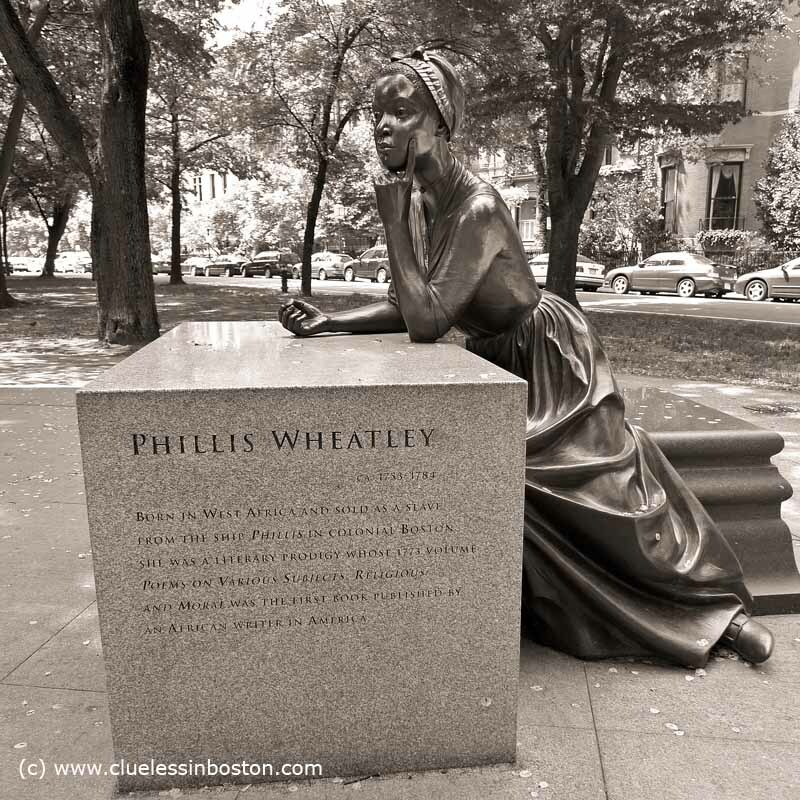 This statue of Phillis Wheatley is part of the Boston Women's Memorial on the mall on Commonwealth Ave. 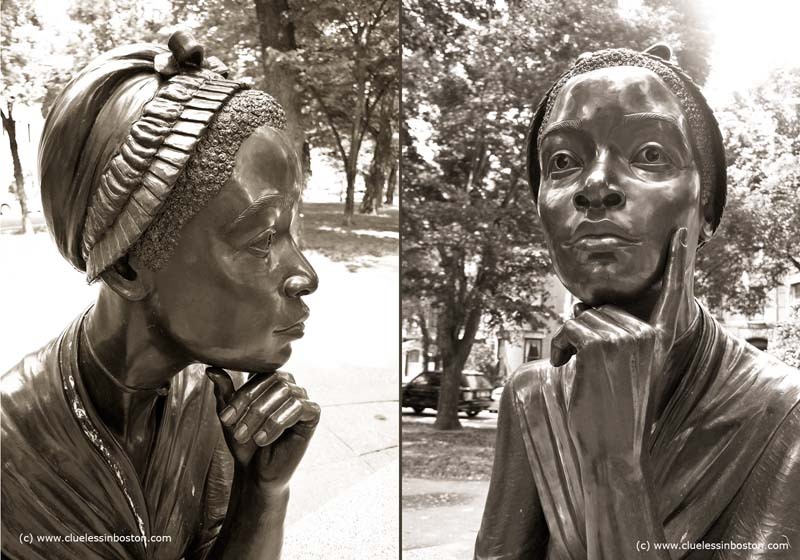 The Memorial celebrates three important contributors to Boston's rich history - Abigail Adams, Lucy Stone, and Phillis Wheatley (pictured here). The sculptures are by artist Meredith Bergmann and represent her thinking about public art. Unlike conventional statues that are larger than life and set upon pedestals, these statues are more human-sized and invite viewers to interact with them. Yesterday, I was reading a book about U.S. litterature history, and that's how I discovered her name! And today, your picture of this fabulously beautyful statue!is it a sign of something?.. They are not only beautiful sculptures, but the history is wonderful. What an amazing artist Meredith Bergmann is. Oh to be so talented. This is such a beautifully conceived and executed statue. How remarkable a woman she was, to have accomplished so much in twenty six years. Beautiful sculpture and history. I like that you chose to sepia - it really conveys an old feel to the subject. Thanks for the link to the artist. These statues are wonderful memorials plus exquisite examples of the artist's talent. Lovely in almost sepia. Now I'm going to want to read her. Her face has such lovely expression. Beautiful! Dunce that I am, I had never heard of Phillis Wheatly until your post. Our Philbrook Art Museum in Tulsa currently has a collection of photographs of the stockades used to house and auction slaves taken in West Africa beginning in the 1700's. It seems incredible that such things could have happened scarcely 150 years ago. I like statues that are on the same plane as the people who pass by, although I do worry about vandalism. This looks like it has not suffered . . . so far. That's beautiful, what a lovely face she has. I bet she'd be surprised to see this memorial.